The online travel services segment in India is a crowded space, with players like MakeMyTrip, Cleartrip, Yatra, US-based Ebix and even Flipkart all vying for leadership position in the market. To beat the competition, Mumbai-based Cleartrip is venturing overseas. In June this year, it acquired Saudi Arabia-based Flyin in its first cross-border deal. The acquisition is likely to give the combined entity 60% market share in the Middle East. Cleartrip had ventured into the Gulf Cooperation Council region in 2012. Founded in 2006 by Stuart Crighton, Hrush Bhatt and Matthew Spacie, who is no longer with the company, Cleartrip offers a platform for booking hotels, flights and trains and in 2016, it introduced Cleartrip Local, a platform that offers curated activities and experiences. What does the acquisition of Flyin mean for Cleartrip? I think it is a recognition of our success in India over the last 12 years and the ability to take all the learnings and experiences in this market and apply that to a diverse set of customers internationally. I think what people, perhaps, don’t know about Cleartrip is that we have been in the Middle East for the best part of five years. Like we did in India, we spent a lot of time on the product and built a large customer in that region with the same approach we took here. We went to Saudi Arabia last year and spent that entire time understanding the market. That is when we were introduced to Flyin and where the conversations began. It is the next step in our evolution and our journey. I think all of this has been made possible with the success we had in India and continue to have here. But there is a great opportunity alongside India in other markets. We have got the right technology and DNA and it is important that we take advantage of that. Why did you choose Flyin in particular? That was a really easy end result. Saudi is a very different market. Obviously, it is very important to have the right payment options, content, the localisation, the Arabic language, etc. It is also a very big market and in many ways, it reminds me so much of an earlier time in India. There is a tremendous change taking place in the market with a very young population who is digitally savvy. We respected Flyin’s approach to building the business. They were very disciplined in terms of how they built relationships with their customers. They were thoughtful in the kind of products that they were putting out into the market. All of that resonated very strongly with Cleartrip and the culture that we have in India and our Middle East business. It was more of a natural coming together than anything else. The Flyin acquisition gives us significant market leadership within the GCC now. As I mentioned earlier, we have been in the region for five years. We dominate the northern Saudi part of the GCC with over 60% market share. With the Saudi market share, we now stand out as the leader in the region. How much of Cleartrip’s revenues come from international operations? Around 40% of our overall revenue comes from our combined international operations. It is a sizeable part of our story. India is, obviously, is the dominant part. But the Middle East combined today is a little over 40%. How do you see the competition in India? The competitive landscape in India has always been very challenging. We focus on top line like everyone else. But we are also fiscally disciplined with our bottom line. I think that is reflected in our businesses today and the unit economics that we have. The competition is powerful and strong. It would always be that way in India. The opportunity is significant to make sure that it attracts that level of competition. We are very clear about the vision and the focus in India and we are uncompromising in the way we do that. It is a measured approach to top and bottom line to build businesses to be profitable throughout the group. What is Cleartrip’s market share in India? We have about 18-20% market share in the country. It fluctuates, but that market share has been consistent for the last three or four years. That is a healthy chunk of a very large market. Our ambition is to steadily grow that number, but while making sure that we are profitable along the way. The Middle East segment is also growing fast for us, where we have a little over 60% share in the Gulf Cooperation Council. Those two regions combined make for a very powerful proposition. How many users do you have in India and globally? I think we get about 12 million unique visitors a month in the Middle East. The size of the Middle East market we are addressing is about 165 million customers. India is significantly more than that. We have been here for 12 years. I think the monthly active users figure in India stands at about 15.5 million. What is the mood like among your investors? 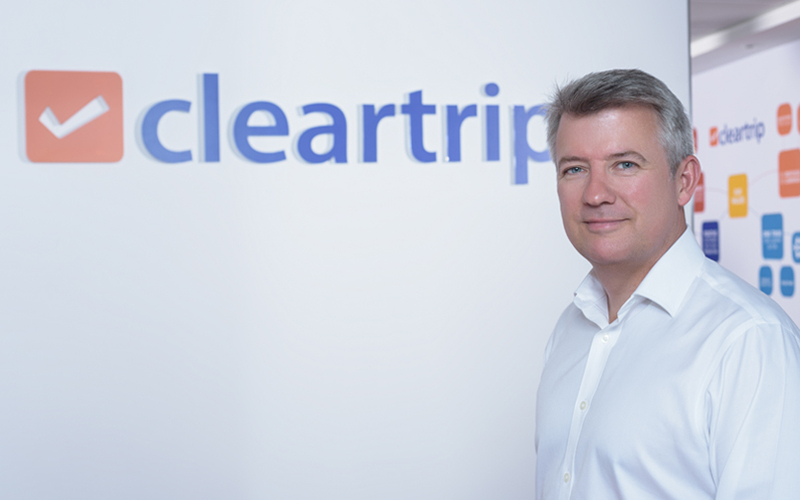 What is the long-term vision for Cleartrip? The narrative around profitability has always been there. We want to make sure that in the next 12 months, we take care of the latest acquisition and come out of it stronger. And then we will see what the opportunities are. We will be a $1.5 billion Gross Merchandise Value (GMV) business this year. We would be trending at about 7.5% margins. I think our scale is very compelling.